One alarmist article in Newsweek said that bitcoin computer operations could consume “all of the world’s energy by 2020.” The website Digiconomist claims that bitcoin operations use as much energy as Denmark, or enough to power 3,071,823 U.S. households. Other analysts say the true figure is smaller, albeit hard to measure because it is spread around the world, generated by an unclear mix of machines and co-mingled with other sources of electricity demand. 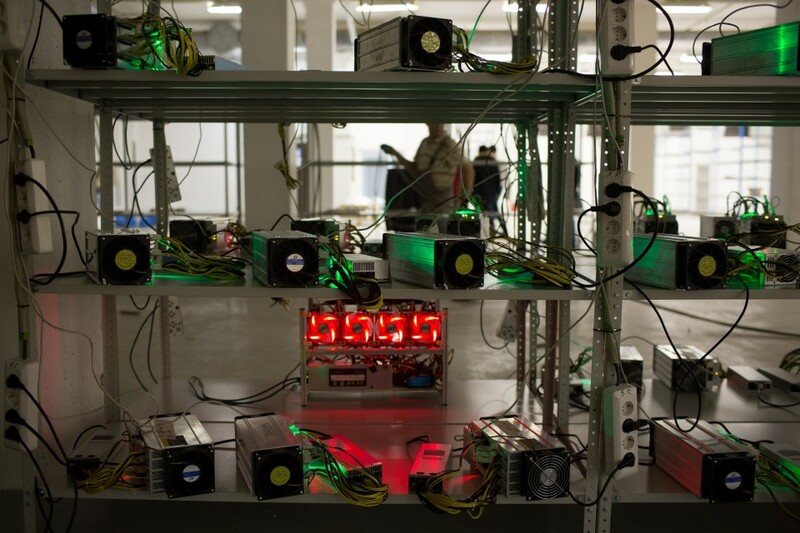 But several experts told The Washington Post that bitcoin probably uses as much as 1 to 4 gigawatts, or billion watts, of electricity, roughly the output of one to three nuclear reactors. That would amount to less than 1 percent of U.S. electricity alone and no more than 0.14 percent of global electricity generation. That won’t devour the world’s entire electricity resources, but it’s a significant drain — and it’s growing fast. Moreover, some of the electricity used, in China in particular, may come from burning coal — a fossil fuel that contributes most heavily to climate change. The reason bitcoin uses a lot of energy is rooted in the way the bitcoin network operates. A digital currency, bitcoin is not controlled by any central bank or commercial clearinghouse but by a network of users who expend large amounts of computing power, and thus energy, building a so-called “blockchain” of bitcoin payments transactions. To compile this comprehensive record, the bitcoin network relies on “miners.” Bitcoin miners have to perform a phenomenally large number of computer calculations to track and verify transactions and solve complex puzzles to obtain bitcoin rewards. As bitcoins become more popular and valuable, the puzzles miners face grow more difficult, and therefore the demand for high-powered computer processing grows as well. That means more energy usage. And that price is soaring driven by everything from a craze in South Korea to the international CME Group electronic exchange, which started trading bitcoin futures Dec. 18. The difficulty of uncovering a new block has increased along an exponential curve of late, even as the number of calculations per second has grown sharply as well since late last year. The bitcoin network is now generating some 14 million trillion “hashes” or possible solutions to a problem, per second. Malone and a colleague calculated in 2014 that the total power required for bitcoin calculations could be between .1 and 10 gigawatts, or billion watts, of instantaneous power. Ireland at the time was consuming about 3 gigawatts steadily, so he compared the two in terms of order of magnitude. But since then he thinks the usage is a lot more. Computing efficiency has increased, but the number of calculations has gone up even more, meaning he thinks that 1.2 gigawatts is now probably the lowest the number can be, and that assumes everyone is using the most efficient computing hardware, which they certainly are not. That’s roughly comparable to the electricity generated steadily by one of the larger utility-scale nuclear reactors in the United States. But there are 99 U.S. nuclear reactors in total, which provide about 20 percent of the nation’s electricity — so while bitcoin is clearly a large energy consumer, it would still be relatively small scale in the context of a major country like the United States or China. Harald Vranken, a professor of management at the Open Universiteit in the Netherlands, has calculated a similar number. On Jan. 1, he calculated the energy usage at .1 to .5 gigawatts, but with the bitcoin explosion this year, he thinks it has increased to between 1 and 4 gigawatts. Still, there are skeptics. Jonathan Koomey, an energy researcher and lecturer at Stanford University who studies the energy consumption of data centers, has found that they consume about 1.8 percent of U.S. electricity, of which he sees bitcoin as a small fraction. Still, that bitcoin mining is energy intensive is shown not just in the calculations by experts, but in the stark reality of how this business works. Energy consumption is a major factor governing the strategies behind where, and how, miners conduct their work. “The economics of bitcoin mining mean that most miners need access to reliable and very cheap power on the order of 2 or 3 cents per kilowatt hour. As a result, a lot are located near sources of hydro power, where it’s cheap,” said Sam Hartnett, an associate at the Rocky Mountain Institute, a nonprofit energy research and consulting group. If bitcoin’s price, and concurrent energy consumption, continued to rise at the clip seen this year, that could be a serious problem. But it’s less clear whether the current rate of growth in consumption would continue. Claire Henly, a manager at RMI, said “there are two ways this problem can be solved.” There can be changes to the protocol of bitcoin that would allow for reduced energy spent, or users could switch to other cryptocurrencies that require less energy expenditure. She said that Ethereum, the second most widely used network, is changing its protocol to reduce energy use. Christian Catalini, assistant professor for technological innovation, entrepreneurship, and strategic management at the Massachusetts Institute of Technology, said that the current energy trends of bitcoin are not permanent. Currently, as many as half of the biggest bitcoin miners are believed to be Chinese firms, which tend to have low capital and energy costs. He also said that “different miners will have different cost structures depending on how advanced their hardware is.” He said that most mining takes place using highly efficient chips customized just to mine bitcoin. Gray said his group at EPRI has discussed whether utilities could use excess data center capacity to mine for bitcoins in their unregulated businesses. But he said he would have to do the math on whether that made economic sense. But at the Rocky Mountain Institute, Henly is most interested in blockchain technology as a way to monitor and control electric power generation in a more sophisticated energy grid. For Intel, the broader blockchain technology holds huge potential in commercial transactions, and the company is designing technologies to support these applications. But Intel’s Reed is not sure whether bitcoin can easily change away from its energy consuming ways, and also points to Ethereum as the next currency in line and one that is more sustainable. Chris Mooney covers climate change, energy, and the environment. He has reported from the 2015 Paris climate negotiations, the Northwest Passage, and the Greenland ice sheet, among other locations, and has written four books about science, politics and climate change. Steven Mufson covers the business of climate change. Since joining The Washington Post in 1989, he has covered economic policy, China, diplomacy, energy and the White House. Earlier he worked for The Wall Street Journal in New York, London and Johannesburg.